Now available in large 8-1/2"x11" and extra large size 12"x14" for Low Vision Patients. For years, the PPCI series has been one of the most valuable tools in the exam room of countless Eye Clinics around the world. 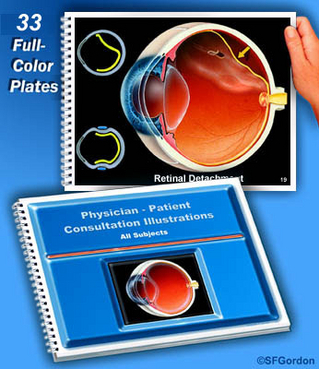 Combined with the beautiful eye wall charts and posters of Stephen F. Gordon, patient education is taken to a new level of immediate comprehension by patients of complex eye care subject matter. 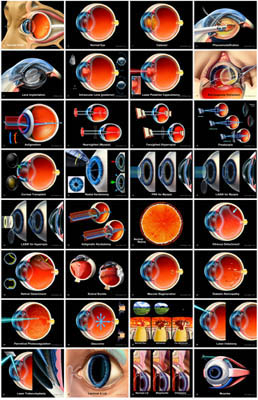 The PPCI and ophthalmic wall charts are specifically designed to be anatomically correct, while at the same time being presented at just that right level of visual complexity for patients to clearly understand the concepts - unquestionably, the most beautiful and didactic ophthalmology presentations available in modern eye care today for patient education. Also see the popular Physician-Patient Consultation Illustrations Series and Optometrist-Patient Consultation Illustrations Series, in addition to the Ophthalmic Eye Wall Charts, Ophthalmology Eye Posters, and Vision Wall Decor on this site. illustrating Ophthalmology and Ophthalmic Concepts for patient education for over 30 years. the complex concepts of eye care and eye surgery.